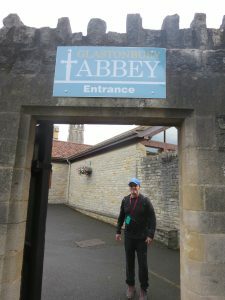 As innocent and historically ignorant as spring lambs, we arrived at Glastonbury Abbey, a 7th century monastery in Somerset, England. 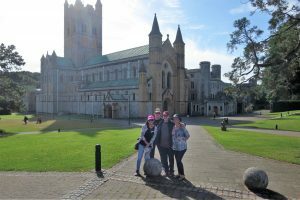 The Abbey once boasted the richest and most powerful monastery in England, and was the hub of activity in a large swath of surrounding countryside. Until crotchety ole Henry VIII, probably in a vile snit between marriages, decided the monastery somehow threatened his manhood (didn’t everything?) and had the abbot hanged, drawn and quartered as a traitor. Things went decidedly downhill after that. 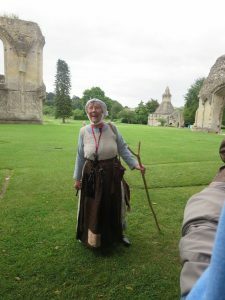 Our beguiling Abbey guide was a buxom middle-aged “peasant” woman with an Edith Bunker voice and razor sharp wit. She astutely zeroed in on the one person in our 34-person tour group who’d rather eat poisoned cockroaches than be the center of attention. Him she mercilessly dragged forward, front and center, to unwillingly bedeck the garb and mannerisms of a 12th century Robin Hood-era friar. Only instead of Friar Tuck, he was Friar Chuck. Yep, you guessed it – it was my own dearly beloved Chuck. He was not amused. But I surely was. To my utmost delight, our lady of the hour began dressing my highly reluctant fella piece by piece in the attire of a man of the cloth, describing his daily duties and abbey lifestyle in the process. 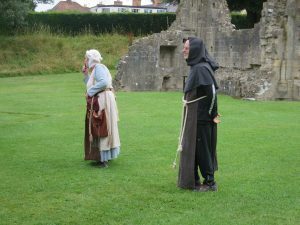 Friar Chuck was required to mime routine daily activities – hauling water, digging graves, hoisting stones (during which I’m pretty sure I heard him mutter, “Just shoot me now”), but was not allowed to smile – certainly not! Unforgivable for a holy man of that time period; after all, life was one long drudge and a grim and vengeful God was hovering about, ready to smite the frivolous to smithereens. Fortuitously, for this particular friar, smiling was not a major temptation. for the lion’s share of our tour, enduring the stares and smirks of tourists far and wide. Totally cracked me up. A memory I’ll chuckle over always. I must say, my little mister handled his unwelcome notoriety very well, for a guy whose unsuccessful portrayal of a tree in a kindergarten play ruined all future stage aspirations. 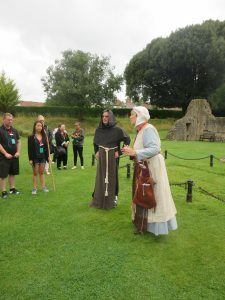 So stay tuned for further adventures of Friar Chuck and Maid Deberan (close as I can get to Marian) as they cavort around jolly old England. Minus an abbey robe. Friendly reminder: Please be sure to subscribe to my blog if you haven’t already (box at top right of your screen). 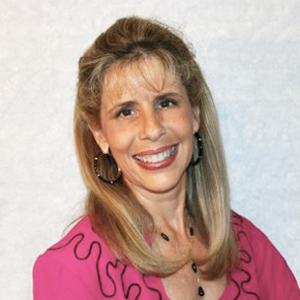 My blog has recently moved; BBFFs who subscribed at my previous blog site will not receive posts directly unless they subscribe again.